← Princeton House Prices Up 7% in 2013. Good Or Bad News? First Look: 255 Nassau Street ‘Plan B’. Last year, a plan to redevelop the building at 255 Nassau Street in Princeton with apartments was shot down by the Princeton Zoning Board of Adjustment. But now, a new plan is plan is on the table, and this is what it looks like! (see photo above)The existence of a new plan for this ultra-walkable site was first revealed earlier this month. Having seen the plans, we can confirm that the new proposal is a mixed use development, with no parking in front of the building, and with a roof deck. 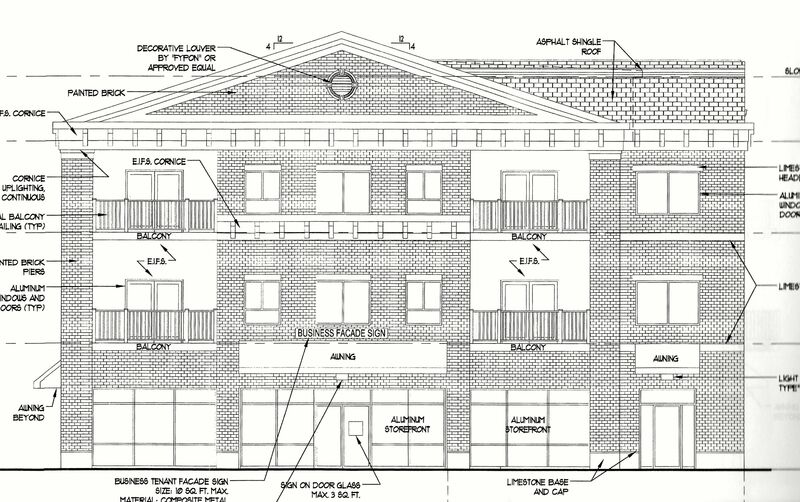 As can be seen in the photo at top, the new proposal, which we’re calling ‘255 Nassau Plan B’, is for a renovation and addition to the existing structure, which currently houses a Crossfit gym. The building will be extended from the existing 2 levels to 3 levels, and a new sloping roof will be visible from the front. Not in the picture: the original ‘Dodge Brothers’ sign on the building’s facade, a reminder of its original use as a car showroom. As we are big supporters of walkable housing, we are delighted to see that 255 Nassau Plan B features 23 residential units, up from the 16 proposed in the previous proposal. At the time of the original proposal, we argued that the site ought to house more people given its highly walkable location. Parking- as usual- was a concern. With any development in Princeton, finding a place for cars to live takes priority over finding places for people to live. In this case, the architect has found room for more cars by cutting a big piece out of the side of the building. This opens up space for eleven more vehicles, and eliminates the need for end-to-end parking, which was a controversial feature of the previous proposal. Despite losing part of the building to parking, the development still finds space for 23 units, and-remarkably- they are quite big units. The most common layout is for 2-bed, 2-ba units, of which there are 11. There are also seven 3-bed, 2-ba units, and two luxurious 4-bed, 2-ba units! The unit size varies from a diminutive 473 sq. ft. to an expansive 1,529 sq. ft. Many units have balconies, and there is a roof deck. Expect them all to get snapped up quickly. Unlike the previous plan, there is no pop-up level. The proposal sticks to a strict 3 floors. Many units have balconies. One unit even has two balconies! 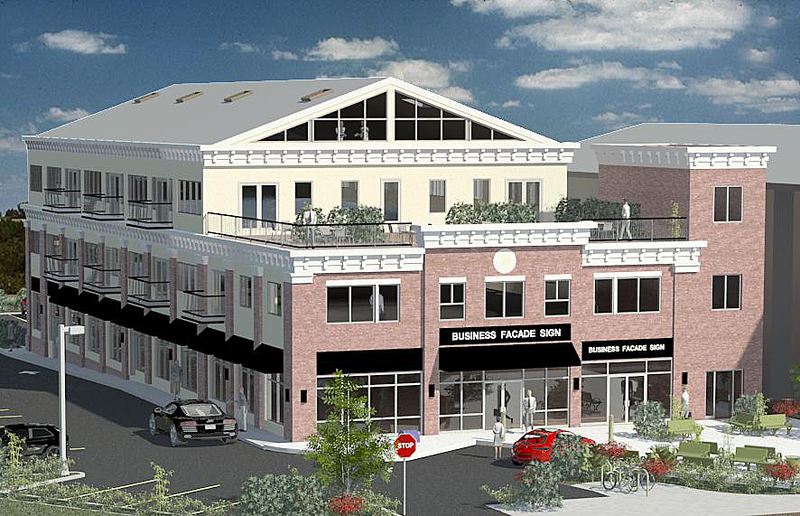 We’re excited to see this new proposal for walkable housing in Princeton. We have often made the case that the town desperately needs more housing, particularly in walking range to the amenities and jobs of the downtown. We can imagine people living in this development and strolling, or hopping on a bicycle, to get to work. This is a land use consistent with Princeton’s stated goal of ‘enticing people out of their cars‘. Hopefully this plan will come before the Planning Board sooner rather than later, but as it is a multi-family development, it must go through a long and laborious process before it gets a chance of approval. The Plan B development can theoretically be built as-of-right, that is no guarantee of approval in Princeton. We’re still absorbing the details of the plans, and we look forward to being able to tell you more in another post next week! What do you make of the new 255 Nassau Plan? Is it an improvement on the previous plan? If you’ve got any questions, let us know and we’ll see if we can work in some answers to our next piece, where we look in more detail at the proposed landscaping and circulation! Get in touch using the comments box below! This entry was posted in Density, Princeton, Real estate, Smart Growth, The Parking Question, Zoning and tagged Apartment, Princeton, walkable. Bookmark the permalink. 6 Responses to First Look: 255 Nassau Street ‘Plan B’. I wonder does the plan have a provision for affordable units? I’m not familiar with the requirements, but I think developments over a certain threshold have a requirement to include affordable units. Yep- four affordable units will be provided. Great plan! It was horrible what the neighbors did to the Carnevale family last year.